If nothing else, three discs� worth of the late, great werewolf performing other artists� material offers irrefutable proof that lurking within every great songwriter is an equally inspired stylist � to know how to write a song you gotta study songs, eh? 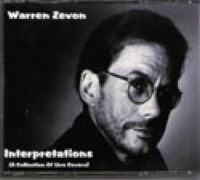 So despite some reservations I have about this three-CDR set, I�m absolutely drawn to the idea of Zevon covering, say, Van Morrison (�Into The Mystic�), Leonard Cohen (�First We Take Manhattan�), Prince (�Raspberry Beret� � the song he absolutely nailed during his collaboration with members of R.E.M. as The Hindu Love Gods), Springsteen, Stones and the Byrds (several cuts) and of course various blues and early rock �n� roll icons. Also dotting this collection are some genuine oddities (�That�s Amore,� complete with a spoken intro concerning Dean Martin, Frank Sinatra and pop music) and outright howlers (�What�s New Pussycat� of course � and Billy Idol�s �Dancing With Myself� -- brilliant). Fascinating stuff, frequently humorous, and quite revealing as well for anyone interested in delving a little deeper into what made Zevon tick beyond his officially released albums and the occasional full-concert bootleg. When it comes time to do the Zevon box set, someone really, really needs to make sure that there�s at least one full disc of nothing but covers.